Week 2 has started with a BANG and a few cuss words. Demolition continues as we are ready to start seeing some positive changes in the house. Even baby steps are one step closer to completion…which I’m convinced will take for-ev-er! 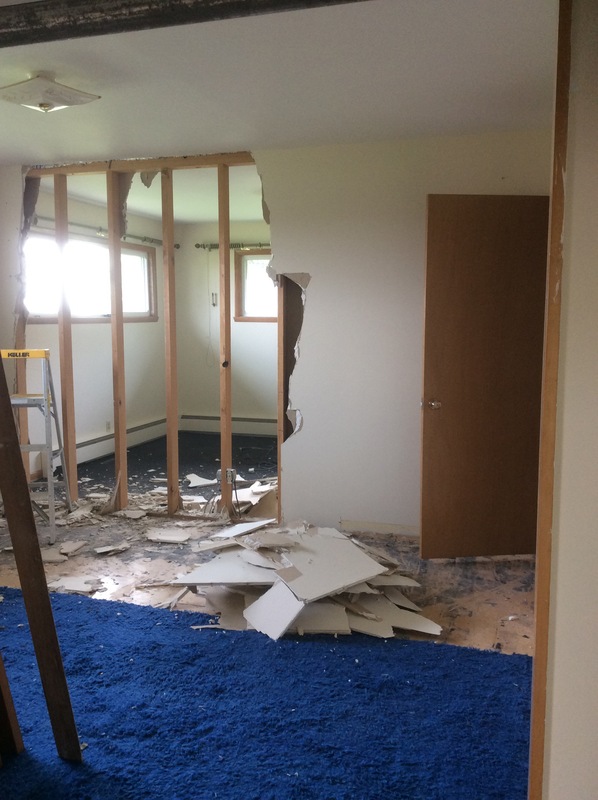 Today’s goal; remove the wall separating 2 of the smaller main level bedrooms. This new room will make up the new Master Bedroom able to fit a king sized bed. I made some progress as shown in the photo below, but boy did I underestimate the materials. I started out feeling strong and prepared after having a nice Mother’s Day the day prior. Unfortunately, that strength quickly drained due to the unbelievable, Guinness Book worthy, almost impenetrable strength of this particular drywall. Well, at least a load of tick infested laundry was completed today (looking at the bright side). Again, baby steps. Time to prepare dinner and work on practicing my sweet smile when my husband asks what I’ve done today. Maybe I’ll just show him my bruises. But! I’m a bit jealous!! I want to have a little farm, nature and my own plants, too. You are welcome to bring the family over!